Join the world’s greatest detective, Nate the Great, as he solves the mystery of the lost picture! Perfect for beginning readers and the Common Core, this long-running chapter book series will encourage children to problem-solve with Nate, using logical thinking to solve mysteries! MARJORIE WEINMAN SHARMAT has written more than 130 books for children and young adults, as well as movie and TV novelizations. Her books have been translated into twenty-four languages. 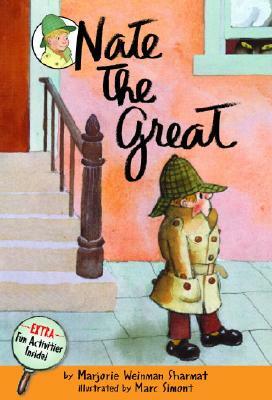 The award-winning Nate the Great series, hailed in Booklist as “groundbreaking,” has resulted in Nate’s real-world appearances in many New York Times crossword puzzles, sporting a milk mustache in magazines and posters, residing on more than 28 million boxes of Cheerios, and touring the country in musical theater. Marjorie Weinman Sharmat and her husband, Mitchell Sharmat, have also coauthored many books, including titles in both the Nate the Great and the Olivia Sharp series. MARC SIMONT won the Caldecott Medal for his artwork in A Tree Is Nice by Janice May Uldry, as well as a Caldecott Honor for his own book, The Stray Dog. He illustrated the first twenty books in the Nate the Great series.